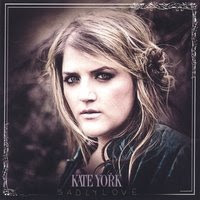 If you are a fan of Coldplay, Sixpence Non The Richer or Keane, you might want to check out Kate York's new album, For You. The first album, Sadlylove was released early 2006. For a couple of years, Kate York has written songs for other people, but for this batch of tunes she decided to step up to the plate and record them herself. A good move as it turns out because the results here are quite stunning. Kate York has such an incredible voice. I fell for her after hearing one of her song, The Right Way. Then I've downloaded her old album, Sadlylove for free on noisetrade.com. Later on after checking her on myspace, I've found that she had released her new album, For You. Well not all of her songs are good but some of them are pretty awesome. You know, in Acoustic/Folks kind of way. I love a song from her new album, For You. Somehow her voice kind of reminding me of Leigh Nash and in listening to her songs I hear shades of Sarah McLachlan. I think her old album is better compared to the new one. The list below are her songs that I really like.